As mentioned above, the temperatures are dropping! Typical weather in Michigan during the autumn months are mid-50s to 70 degrees. To me, that’s perfect! Add in the days where you have full sun and you’ve got a teeny weeny taste of heaven! The leaves are changing! I do like it in Spring where things comes to life and the leaves start appearing, but something I like even more so is when these leaves show us just how creative and brilliant and gorgeous our Creator is! I don’t even have a favorite color. I like them all! From dull browns, to sunny yellows, to fire oranges, to burnt reds, the trees display a vibrant work of art. Having said that, it brings me to another reason I like fall. Fall color tours! I absolutely love waking up on a crisp morning, getting some coffee or hot chocolate (whatever mood I’m in) and a donut, and then driving the day away on scenic roads, admiring our view. Michigan has so many routes to explore! Apple picking! Hands down a must do during the fall with the family. My kids love picking apples with us. We have an orchard just a tad south of us that offers unique varieties of apples, all of which are tasty. Fall-like desserts! 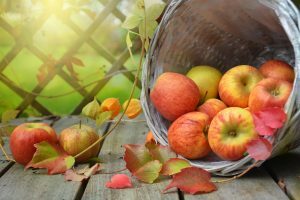 With all of the apples that my family and I pick, we have to do something with them! My favorite has to be apple crisp! A couple of years ago I found this recipe that is just to die for. Anytime I make apple crisp, that’s the recipe I run to. It’s also a fan favorite of many family members. More than one person begs me to make it every year. It’s that tasty! But don’t stop there. I love pumpkin rolls, apple fritters and other apple/pumpkin donuts, and so many other things that it’s just not healthy, lol! While we are talking about food, let’s add in a drink. APPLE CIDER! Oh man, this stuff is delish! It’s sort of a staple at our house from September until about mid-November. The holidays are approaching! That’s right, I actually look forward to the holidays! I love Halloween, Thanksgiving, and most of all, Christmas. It’s just the time of year that gets exciting. Busy at times, but so worth it! While for some it’s a reminder of busy-ness or snow or even the time when school is mandatory, autumn is by far the best time of the year for me. There’s just something about it that makes me come alive! What’s your favorite season? Why?